…There are many ways of seeing aside from those that can be captured by pointing photofloods at an object and documenting it in Kodachrome. A few years ago there was a special slide film called infared, which mixed visible light with near infared to produce unexpected colors. Pictures of autumn leaves would come out partly the way they naturally look and partly glowing pink-and-turquoise. A picture of a hand would look a little waxy, with the surgace veins showing through as if the skin had become transparent. The color infared film was also a way to think about the vision of other animals. Some animals see different wavelengths than we do; this raises curious questions about how they perceive the world. Apparently frogs can see color but tadpoles can’t: is the metamorphosis from tadpole to frog like the change from black-and-white Kansas to colorful Oz? Bees can see some ultraviolet, so that they can look at flowers that appear perfectly white to us and discern patterns in them. But at the same time, Bees cannot see the other end of the spectrum–they can’t perceive red, and so their vision begins in the ultraviolet, continues up through the spectrum of purple, blue, green, yellow, and stops at orange. To us, the two extreme ends of the spectrum look very similar: red on one end seems to blend well with violet on the other. In terms of wavelengths they are opposites, but in our perception they seems like a good match. This the reason why artists have been able to bend diagrams of the spectrum into color circles, connecting the red to the violet to make a continuous (and unscientific) cycle of color. If you think of what happens when you mix the deepest red with the deepest violet, you can only imagine a color very much like red or violet. Most colors mix to produce new colors, so that for example, blue and yellow make green; but red and violet seem to only produce more red and violet. That’s odd if you think of the spectrum as a number line. Violet at one end of the spectrum has a wavelength of around 420, and red is about 660. You might think that if they were mixed, the result would be in between—say, about 540, which is the wavelength of green. But red and violet do not mix to produce green. Bees are different, and they see mixtures of their two extreme colors (ultraviolet and orange) as a third color, which we cannot even begin to imagine. It is called bee’s purple, though there is no reason to assume it looks anything like purple. Perhaps to bees it is more like our yellow or our indigo…or perhaps it’s something entirely new. We have no capacity to imagine new colors. No matter how hard you try, each color you imagine is going to be a color that exists and probably one you’ve seen before. You can make up a new color—the philosopher Nelson Goodman made up “grue” and “bleen”—but you cannot imagine how a genuinely new color looks. We are stuck with the spectrum and its mixtures, but we know that other animals may not be. And what about other ways of seeing form? Animals that can change their color, like flounders, octopi, and chameleons, provide a way to think about that. A flounder will not only change its color to try to blend in with its surroundings; it will also change its pattern (figure 9). 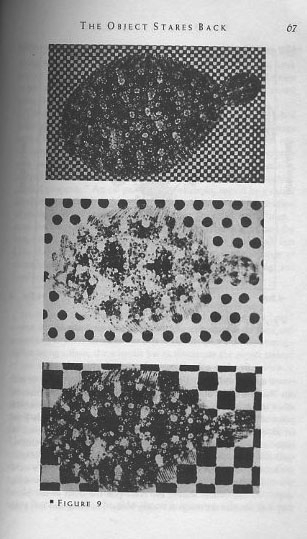 The flounder in these pictures has a fairly good idea of what a dot pattern looks like, even though it ends up making dots that are several times too large. But it messes up the large and small checkerboards. Faced with a small checkerboard, it produces some small white patches, but there are too few of them and they are unevenly spaced. For the large checkerboard it manages larger spots, but it cannot get the evenness of the pattern, and its silhouette remains clearly visible. In describing things this way I am of course seeing as a human, and what these pictures may show is the way that the flounder sees those patterns. It could be that, for the flounder, those are perfect matches, and a large checkerboard really is a mottled black surface with some blotches of white. The flounder might be communicating its vision with its body, letting us glimpse the world through its eyes. AKT: If other animals had to examine human sight, what would they use to describe the way we envision the world? I realize this question is too big for a blog post and certainly too large for a comments thread. Even Eilkins didn’t seem completely finished with his contemplations on the “nature of [our] Seeing” when he ends this book. In his closing, he writes, “this book could have been five hundred pages long or five thousand. Vision is inexhaustible…” …and the investigation of sight reminds us that life is not the same in every place; nor is it the same for every being. The excerpt comes from Elkins’ book, The Object Stares Back .